Anyway, my partner was Merran waaaaay down under in Australia. 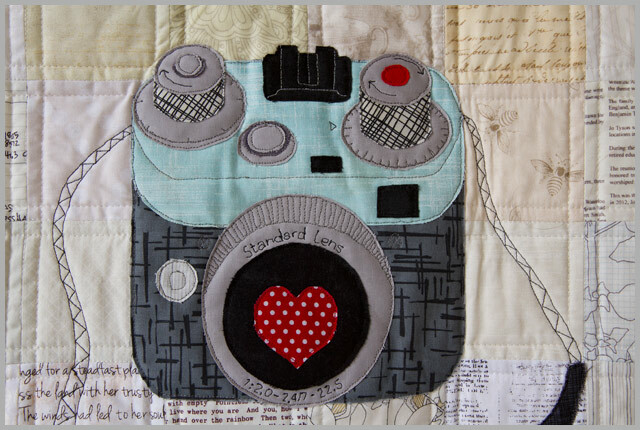 She had a couple of mosaics in her feed, but one wee pouch lurking in the bottom corner of one mosaic, which had an SLR type camera applique on it, sparked my creative urge. I hunted around a bit, found a graphic I liked, blew it up to A4 size (the biggest paper I happened to have on hand for my printer), and then set about turning it into a pattern, and then into a mini. Merran had also mentioned a love of LV and text prints, so that covered the background for me, and I decided to go for a simple patchwork so as not to detract from the camera. I added in the camera strap, which was a combo of stitch sketching and applique, because I felt it looked a bit odd without one. For the background I quilted 1/4″ either side of each seam to keep it simple. Here’s a close up of the camera. Yes, I wrote the words and the numbers in stitches. Yes, I clearly need my head examined! I added in a few wee extras – an initial ornament I’d found, a wee pot of lush body cream, the clutch from my Love Sewing pattern last month and a pack of Percy Pigs as I suspected chocolate might wilt under the Australian heat at this time of year! Details like the fabric used to show the sides of the knobs and the lettering just take this awesome mini WAY over the top. Love it, K! Wow! You did such an amazing job! I would be blown away to get this mini in a swap. 🙂 The details are just so perfect. So fab! I saw this as pinned on Pinterest by the fat quarter shop a few dates ago. Deservedly so! What a lovely swap. You certainly researched what she liked. I'm sure it will be hanging proudly in her home. What's a Percy's pig? Love the mini! It's just fabulous Katy. 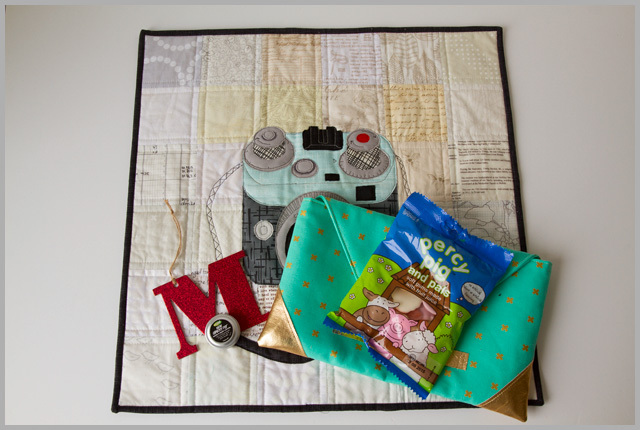 I love everything about your mini quilt. I'm in Australia too and Percy Pigs are not familiar to us Australians. I'm guessing they are soft lollies? She will be over the moon! 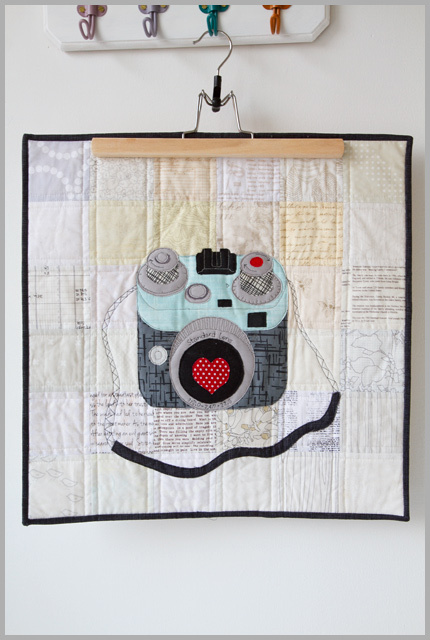 That is the coolest mini quilt!! I can imagine Merran was bowled over when she received it! Those percy pigs sound mighty good, though I can't imagine what they taste like. everyone loves a percy pig. Your mini is brilliant, the detail in the camera is so well done. It can be hard to keep the detail in applique. It is beautiful! Well done! I saw this pop up on IG and gasped. K, this is absolutely amazing. This is very cool and I love all the bits of detail. Nicely done!! 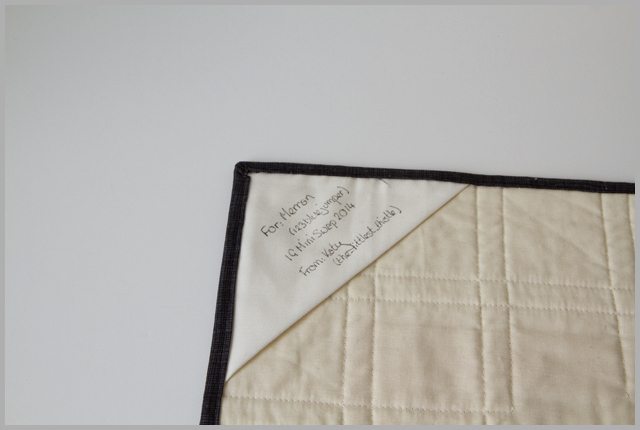 Oh this is gorgeous – and I'm so glad it went to someone as lovely as Merran. I *may* have forgotten to label mine, whoops….